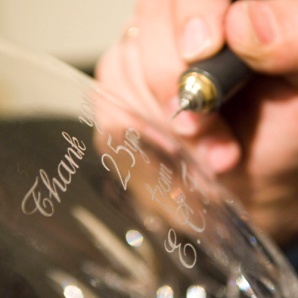 Why not add your personal message to your glassware for a special presentation or gift? If you have a corporate event or presentation and would like to mark the occasion by presenting some crystal or glass we can engrave logos onto almost any piece. We offer in-house hand engraving as well as a sand blasting service plus we have an extensive range of trophies and awards available off the shelf in our engraving and trophy shop. Please talk to any member of our team to discuss your requirements and our competitive pricing.